What a way to start the term! My name is Taryn and I am a Graduate Research Assistant at the University of Western Ontario. As part of the Public History program, I am doing an internship at the Banting House National Historic Site of Canada to learn new skills and enhance my knowledge of historical sites. I moved to London last week knowing barely anything about Banting House, apart from that it probably had something to do with the history of insulin and that the projects they have on the go looked interesting. I hadn’t realized how much information there is on Sir Frederic Banting’s life while he lived in London and how he made his discovery that enabled him and his team to produce insulin. Grant, the curator at the museum, was great in showing me around and explaining more about the significance of the work that Banting did as well as what the site means for the diabetic community and Canadians as a whole. This week there has been a lot of information to get through- I’ve gone through some of the policy documents for the site as well as studied the Commemorative Integrity Statement for Banting House. There is a lot more to running a museum than just displaying objects and text for visitors! While not the most exciting work in the world, reading up on this sort of information really helped me to get a better understanding for what the staff and volunteers at Banting House are working towards. Hopefully I’ll be able to help them with some of their projects, events, and research this year. Banting House is not just a place to showcase artifacts from Banting’s life when he lived in London; it is a place that allows visitors to experience the results that his work has had in helping people with diabetes live more complete lives. The gallery in the main floor containing comics that featured Banting demonstrates how other people saw him and the work he was doing. Banting House also showcases some of Banting’s interests outside of the medical world such as his painting. The collection of his artwork that is on display allows visitors to see how his art progressed over time and that there was more to him than his work in medicine. One of the most interesting things about the site that I’ve seen so far is the space for Dear Doctor Banting letters. Visitors are able to write a letter to Banting that explains what they are thankful for or what they’ve been through. It’s a great way for people to express what Banting’s discovery means to them and shows just how many people have benefitted from his work. This is an awesome example of how visitors can get involved with the exhibit in a meaningful way. There are some really valuable things going on at Banting House that will hopefully get more people thinking about what impact diabetes has had, or could have, on their lives. I am looking forward to an awesome eight months at the Banting House National Historic Site and I can’t wait to see what’s next!! 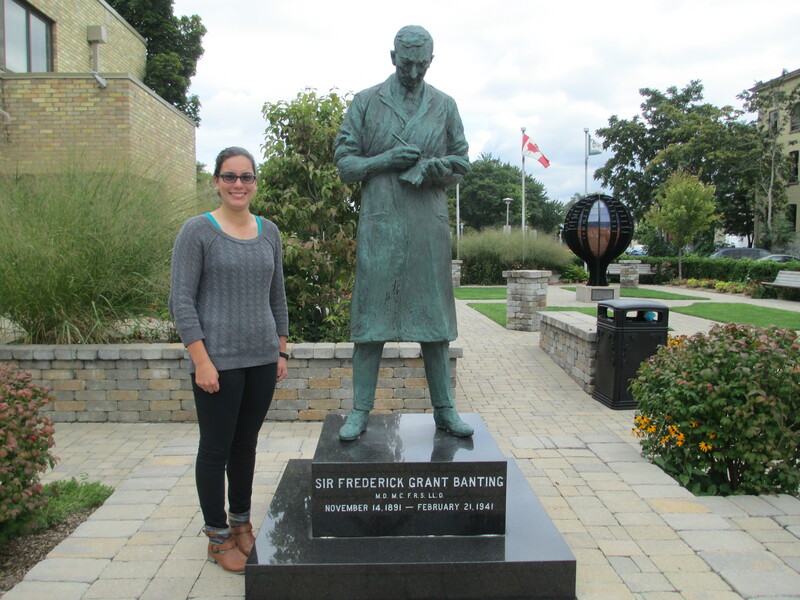 Taryn with Sir Frederick Banting’s statue in Sir Frederick G. Banting Square. Next Post Week 2 at Banting House: Tours and Event Planning!